I've never had a Steak-umms burger before, but Mom has made them in the past for herself and Dad and has really enjoyed them. This week at Stop & Shop they were on sale for $6.99, so Mom decided to buy them again. I'm looking forward to the day that she throws them on the griddle because she had nothing but good things to say about the taste. 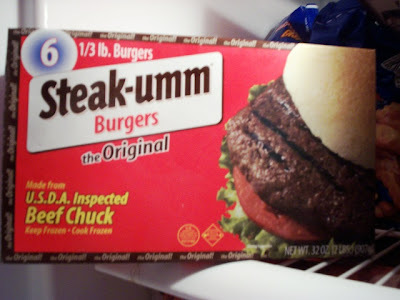 THE VERDICT: Although Mom doesn't usually like frozen hamburg patties, she found the Steak-umms brand to be surprisingly tasteful. They were just the right thickness to make a good sized burger, and cooked up nicely without too much shrinkage (which can sometimes happen with frozen burgers). All in all, Mom said that they are great for when you're in a hurry to make dinner for your hungry family (that must mean me! ).